Cooking with seasonal ingredients takes advantage of when produce is at its best. There’s usually more flavor, it can be more cost efficient, and it just feels more genuine. Each month I’ll cook a dish showcases and in-season ingredient. I may make brussels sprouts all year long, but now is when they’re really in their prime. So for now, let’s forget how I very simply roast them just about once a week and do something a little different so we can celebrate the moment they’re having this month. This recipe is really no more difficult than a normal olive oil/everyday seasoning roast. 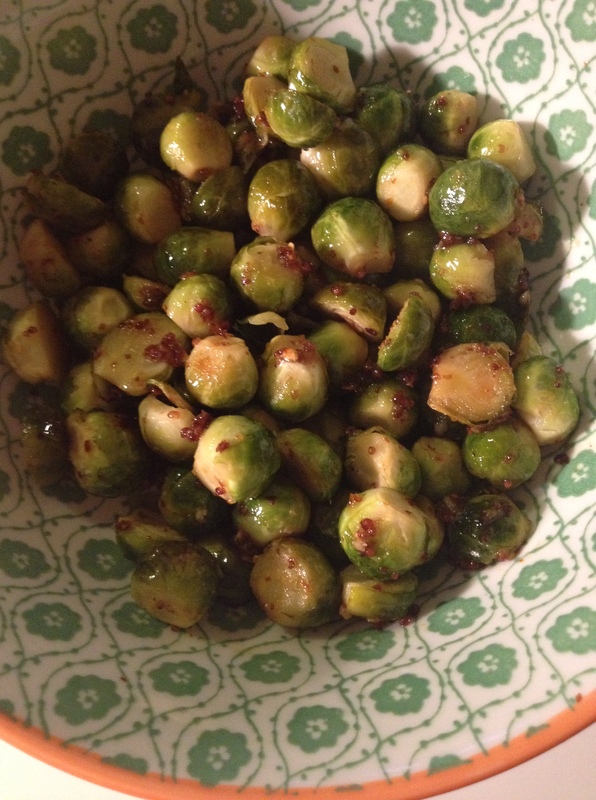 I used this recipe for spicy honey mustard brussels sprouts and loved how they came out. I’m not afraid of spice so I was liberal with the crushed red pepper and really liked how even my spicier version still left room for the sweet honey to shine through. This sauce would be great for chicken wings in case anyone is already thinking about Super Bowl food. The other good thing about this sauce is that you don’t have to follow the recipe exactly. I didn’t feel like getting out my measuring spoons so I just filled up a soup spoon til it looked like enough honey or mustard. I eyeballed the olive oil and have no idea how many sprouts I used. I picked them up from a farmers’ market so it’s not like I could buy two packages as the recipe instructs. I did, however, get one package of the cutest little baby brussels sprouts. They were a little more expensive than their large brothers, but they were too adorable to pass up.